What comes to your mind when you think of dangerous or hazardous baby products? Small toys? PBA plastic bottles? Or flame-retardant clothes? The list of culprits is rather lengthy. But, the astonishing fact is that frequently used baby products can be unsafe for your baby too! Although these products do not meet the government safety standards, they are easily available at most stores or consignment shops. But you don’t have to fret about which product you should avoid anymore. 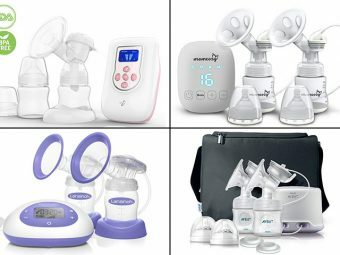 As always, we at Momjunction have listed ten of the most dangerous baby products that you should desist from using for your child. Check them out below. Crib tents are intended to keep the toddlers from climbing out of the cribs, but they can also become death traps. The constant pulling and poking by the little fingers can tear apart the mesh. And if your little one tries to get out, he can get trapped or tangled. If your kid has the habit of climbing out of the crib, then get him a toddler bed. The bed looks like a regular bed but comes with a crib mattress. These wedged or flat mats are designed to keep the infant on his back during the sleep. It claims to reduce the risk of Sudden Infant Death Syndrome and colic diseases too. But no research supports these claims. On the contrary, sleep positioners increase the likelihood of suffocation. The CPSC states that 13 deaths reported over the past 13 years are related to sleep positioners. Nothing. 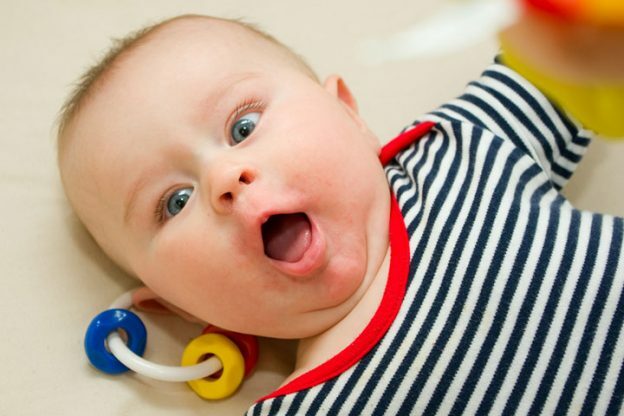 Your baby will control to roll over once he has the neck strength. You may think that the cute bumper inside the crib would prevent the tiny limbs of your child from being stuck between the rails, but in reality, these pads are one of the unsafe baby products that causes suffocation and strangulation hazard. It is even linked to Sudden Infant Death Syndrome. The baby’s head can be caught on the side of the crib and the bumper. Older kids can also use the bumper to crawl out of the bed. You can try a breathable mesh line instead. It will prevent the baby’s arms and legs from getting wedged in the crib slats. A walker may appear a great idea because it helps the infant stand and walk before he can do it on his own. But it is not as safe and convenient as it may appear. 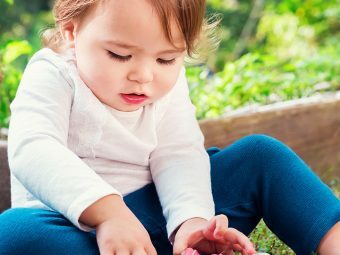 Every year, more 21,300 injuries associated with babies rolling down the flight of stairs are reported in the emergency room. It’s also been said that walkers delay the children from reaching their development milestone. 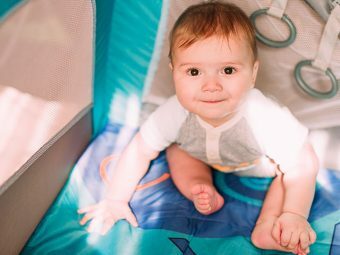 A walk around or station baby activity center will let your child move around safely on a secure base. Co-sleepers, also called bedside sleepers, allow children to sleep near the mothers for nursing. But at the same time, it also increases the risk of suffocation because of the excess padding. Plus, the sides of the co-sleepers are very low. Even worse, a flimsy parent can roll on top of their baby. So co-sleeper is one of the recommended baby products to avoid strictly. A full sized crib with fixed sides is definitely a safer option. Or just share the bed with your baby. The little mirrors and stuffed animals attached to the front of the car may seem like a godsend to keep the kid entertained in the long rides. But car seat experts opine that 99% of them are not safe. The rule is- “if it did not come with the car, do not use it”. And just think, would you really want a toy hurdling your tot’s face while you are riding? No, right? Give your child a teether toy to play in the car. The danger of the bathtub seat lies from the false sense of security that it provides. Yes, it helps babies sit upright, but also increases the risk of tipping over. In the past 16 years, bath seats have been tied to 175 infant deaths. The suction cups that is meant to secure the position never really work. A hard plastic baby bathtub is definitely a safer alternative. But no matter which baby tub you are using, never leave the baby alone, not even for a minute. These cute and colorful chairs had millions falling for it when they were launched, especially since it looked like a handy way to feed the infants. 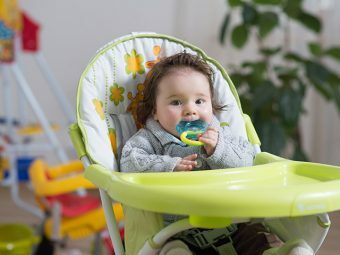 The product was recalled when CPSC received reports that infants fell off the seat by leaning, arching or rocking themselves. But the product is back in the market, this time with the strap to keep the baby safe in his seat. But that’s not enough as the entire thing can topple over the infant. A stationary activity center or a bouncer seat would be cool. But do not place them on the bed, counter or table. Having your baby snuggle up to you while walking or working may look adorable. But a shocking fact is that over the past 20 years, there have been 14 deaths associated with sling carriers. Being pressed up against the body for a long time can pose the risk of suffocation. Skull injuries, head injuries, and fractures have also been reported. Ring Slings are a safer alternative when used properly. Handheld baby carriers, strollers or backpack carriers are covered by the safety standards and would make a safe pick. These plushly monogrammed blankets and pillows may look adorable, but they are ideal for decorative purposes only. Your infant can get tangled in the blanket or smothered by the pillow, leading to suffocation. Keep your baby comfortable in a swaddler, footed onesie or a sleep sack. We hope you understood that not all products sold a baby-specific stores are safe for your little darling. Have you used any of these products? Or did we miss out any dangerous baby product? Then please tell us by leaving us a comment below! We’ll happily include it in our list.